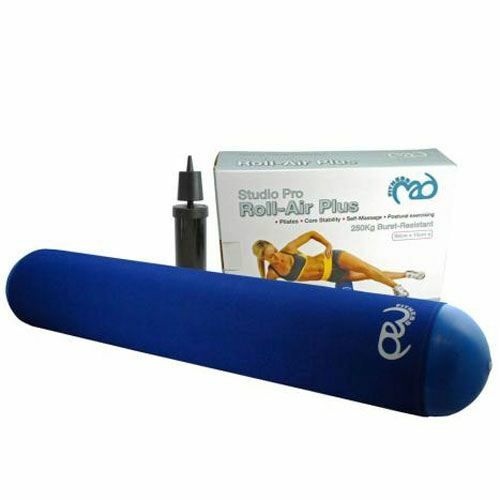 The Fitness Mad Roll-Air Plus Stability Roller 6" replaces the conventional foam roller, offering a full length, high performance alternative that will not lose its shape and can be inflated to match your desired firmness. This unique design combines an inflatable roller with a long-lasting cover, which both protect the roller and ensure that it maintains an ideal cylinder, allowing the roller to reach its full length. The Roll-Air can be deflated and hung up to save storage space or for travelling and can be carried over the shoulder using the fast release carry string supplied. The carry string also enables one person to carry multiple rollers, making the Roll-Air ideal for studio use. for submitting product review about Fitness Mad Roll-Air Plus Stability Roller 6".